The World Meeting of Families ‘Icon of the Holy Family’ will visit Church of the Resurrection, Mallow from 31st October to 1st November. A specially commissioned WMOF2018 icon of the Holy Family was unveiled and anointed on the 21st August 2017, during the launch of the one-year programme of preparation at the National Novena in Knock, Ireland. The icon was written by Mihai Cucu, a Romanian iconographer (helped by the Redemptoristine Contemplative Community in Drumcondra) as part of their ongoing prayer for families. The icon is meant to encourage both reflection and prayer as part of the journey of preparations to World Meeting of Families 2018. 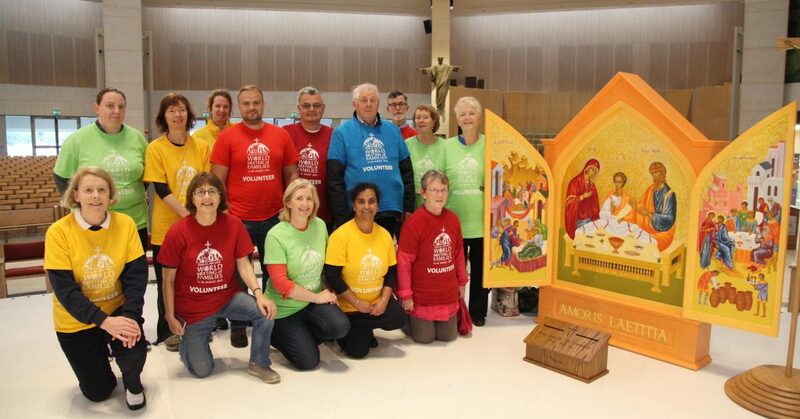 Following the official unveiling at the National Novena in Knock, the icon will travel to each Diocese in Ireland. At the national launch of the preparations for the World meeting of families, each diocese was presented with a Petition Box which will initially accompany the Icon of the Holy Family and will remain in the Diocese for the coming year to gather family petitions. All of the contemplative communities around the country have agreed to take a share of these petitions throughout the year and to pray for each petition received. In June of next year we will gather up all of the petitions and bring them to the Final Mass for WMOF 2018. This will be the only opportunity in the diocese to visit this unique icon and pray for your family intentions.